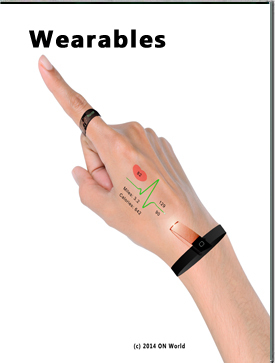 Sensor-infused and cloud connected wearables are disrupting today's smart devices and will create a $50 billion industry within the next five years. With over 400 unique products, the mobile sensing wearables market tripled in 2013 over the previous year and continues to accelerate with the emergence of new product categories such as smart watches, smart glasses and a range of consumer wearable sensors as well as growing industrial and enterprise solution. Over the next five years, 700 million wearable tech devices will be shipped for global annual market worth $47.4 billion at this time. Hardware will make up the majority of the revenues during this period but monitoring services, mobile apps and subscriptions will grow faster. Consumer wearables markets such as smart watches, smart glasses and personal sensors will surpass sports/fitness in 2014 and make up two-thirds of the revenues in 2018. Based on input from over 1,000 individuals, this report analyzes 12 wearables markets and the key technology advances as well as an in-depth evaluation of >70 public and private companies and their offerings. The report also presents the key findings from a recently completed consumer survey on wearable technologies. ON World has been covering Internet of Things markets such as low power wireless and sensor networking since 2002. This report is based on phone interviews and surveys with 1,050+ individuals including consumers, manufacturers, developers and suppliers. ON World provides global business intelligence on smart technology markets. For the past decade, our research reports and information services have been sold to Fortune 1000 companies, startups and investors worldwide.